APRIL 2007 -- The calendar says it is Spring. It is a time of renewed growth. It is time to throw away those winter blues and get a fresh start on a new year. It is a time of renewed energy and vigor. Let’s put this new energy to use to help our Granges grow. Now is the time to start preparing to Celebrate at Good Will Grange Hall on August 25th. 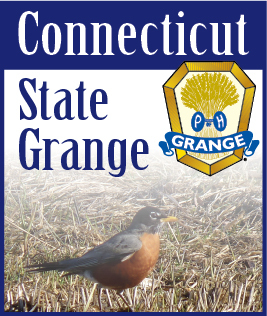 We will have our Grange Photo Contest that day. There are five categories – America the Beautiful – Animals – Grangers in Action – Family Celebrations and Historic Places or Events. There are lots of opportunities this time of year for pictures. We all take short trips – New England has many historical places of interest. Graduations and Weddings make great entries in the Family Celebrations category. Use your imagination. Enter your photo and you could be a big winner. You can get the complete rules from your Lecturer or just drop me a line and I will be glad to send them to you. This has always been one of our most popular contests. Let’s hope that the switch from the Fair to a special day for all Grangers and their families and friends will only increase entries. Remember this contest is open to all Grangers and their children and grandchildren. The prizes will be awarded and the pictures returned at the end of the day. We are also planning a program that evening for all to enjoy. If you know of anyone who would make a good addition to our line-up please let either myself or Betty Jane Gardiner know. The CWA will also be holding their judging that day. You can get all their details from Betty Jane or any member of her committee. Let’s all work together to make this a rewarding experience for everyone. With the arrival of better weather, I hope to be seeing lots more of you around the State. Enjoy Spring! Enjoy your Grange Journey!